It’s a reasonable argument that all the great screen Mawnsters of film history — your Draculas, your Wolf-and-Cat People, your King Kongs and your Creations of Dr. Frankenstein — are not simply “misunderstood,” but destroyed for the very reasons that make them beautiful. For most of them, especially in the days when Mawnsters didn’t so much kill people as just look at them out of the movie screen with their hands or paws raised in a vaguely defensive pose, their only real crime was in Daring to be Daring — for rejecting the bland, and for being (much) more interesting than anyone else in the movie. If there’s one thing that angry villagers can’t stand, it’s people who have the temerity to reject the villager’s life of quiet desperation and instead color outside the lines, with all their innate individuality and talents on display for the world to see… the ones who choose Live Large in a world of pygmies. Because God Forbid anyone should be Different. God forbid anyone should reject the Status Quo, and live a bright, burning life as a Magnificent Mawnsteh! Quick, John-Boy, light the torches! We have one of those pesky individuals to burn. That began to change in the early-to-mid 1940’s, when Hitler and WWII had finally impressed upon audiences that the real monsters were not the ones who just needed a haircut or who happened to have bolts plunged into their necks, but were instead people just like themselves. In the movies of the ‘40s that I’ve been watching this Halloween season, the monsters (they don’t deserve to be called “Mawnstehs”) are altogether commonplace. Queen of Spades, a British thriller from 1949 starring Anton Walbrook and Dame Edith Evans in her first screen role, does have a supernatural element… but it’s less in the way of a horror movie and more a cautionary tale with some chilling bits. Nonetheless, the chilling bits are genuinely chilling, as Walbrook frightens an old lady to death in his attempt to wrest from her the secrets of gambling with cards. Later, her spirit comes to call on him in his lonely garrett — bearing a gift that we all know he shouldn’t ought to take. This being the era of human monsters (that is, common people who give in to their lowest, darkest instincts), he of course ignores common sense and charges blindly and happily to his doom. It’s all done with shadows and candles and snow and dark passageways. To twist the old joke, when you look up the word “atmospheric” in the dictionary, Queen of Spades is the definition. In at least two of the classic chillers that Boris Karloff did with Val Lewton, there is nary a Conventional Monster in sight. Isle of The Dead presents us at first with a standard “quarantine” drama in which a group of people are stranded together in a place from which the only escape may be death. Death Himself is present from the opening frames of the film, and dogs the characters (there are no heroes) throughout. Karloff not only lends it gravitas, but leads us on; his character resides in the dark of human experience. But the real monster in Isle of The Dead is simply these: Superstition and Ignorance. It’s because of these that something horrible, something not at all supernatural, happens to a character that we had previously dismissed as insignificant: and from there on the final ten minutes of the picture become a Shakespearian drama of Fate playing out in the most horrible of ways. Isle of The Dead teases and sets us up for its entire first hour, and just when you’re starting to nod off it delivers a single shock of the first magnitude, after which all you can do is watch helplessly. Bedlam is even more terrifying: because it’s real, and because it could still happen today. 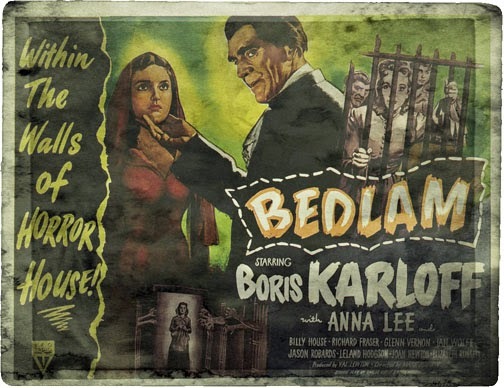 Karloff plays the apothecary general of a notorious London madhouse, whose cruelty towards the inmates is only exceeded by his greed, and the obsequious subservience he displays to his Tory patrons. Since the story is all about a moral and philosophical awakening, we begin with Anna Lee in a decidedly anti-heroine role, as the protege (more than somewhat arrogant herself) of a fat Tory lout. But when she objects to the treatment of the asylum’s inmates (and, more specifically, when she clouts Karloff across the face with a riding crop, a sin for which you know very well that she will not be forgiven) — you guessed it, Karloff pulls a few strings, and his rich patrons see to it that she is herself committed into the asylum — and into Karloff’s waiting hands. This is the single scariest thing about the picture: you know that this happened all the time, and you know that it still happens all the time. Stand up for what’s right, make a nuisance of yourself to the wrong Rich People, and see how fast you’re put away in a dark place where no one will ever hear from you again. We still live in a world where people can be spirited away for no good reason… where people can have their property and even their children taken away from them; where they can be murdered by the police just for having the wrong skin color, or for standing on their rights. Here indeed are the monsters that are more terrifying than any werewolf, any vampire, any Frankenstein’s creature: here are the brainless Angry Villagers who have been empowered by the wealthy to enforce the Status Quo. Reject the principles of enslavement, color outside the lines… and watch how fast they light the torches. Where's Count Floyd When You Need Him?